L. C. Henderson Greenwood (September 8, 1946 – September 29, 2013) was an American football defensive end for the Pittsburgh Steelers of the National Football League (NFL). Greenwood was born in Canton, Mississippi. He graduated from Arkansas AM&N (now University of Arkansas at Pine Bluff), where he became a member of the Beta Theta Chapter of Phi Beta Sigma fraternity. 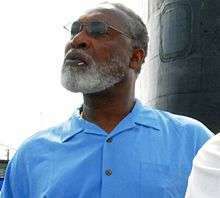 He was also named the 1968 Ebony All-American defensive lineman in the Southwestern Athletic Conference (SWAC). Greenwood was drafted by the Pittsburgh Steelers in 1969 in the 10th round. In 1971, he became the starting left defensive end. One of the four members of Pittsburgh's famous Steel Curtain, he remained there until retirement in 1981. Greenwood, who was 6 feet 6 inches tall and weighed 245 pounds, was a six-time Pro Bowl player and was named to NFL All-Pro teams in 1974 and 1975. He was named All-AFC five times. He also led the Steelers six times in sacks with a career total of 73½ (sacks were an unofficial stat at the time). According to records kept by the Steelers, Greenwood's highest single-season sack total was 11, which he attained in 1974. He further had 14 fumble recoveries in his career, including five in 1971, which tied for the NFL lead. He had 4.7 in the 40-yard dash, and that speed allowed him to dominate his position. In Super Bowl IX against the Minnesota Vikings, Greenwood batted down two passes from Fran Tarkenton. In Super Bowl X against the Dallas Cowboys, he sacked Roger Staubach four times. Greenwood played in all four of the Steelers Super Bowl victories in the 1970s. Unofficially, Greenwood had five sacks in the four Super Bowl appearances. Greenwood was known for wearing gold-colored shoes on the football field to help announcers distinguish him from the higher-profile Joe Greene. Greenwood was called “Hollywood Bags” because of his desire to become an actor after retiring from football. He was a finalist in the 2005 Pro Football Hall of Fame voting but did not get elected. He was again a finalist in 2006, but was not elected. Greenwood has stated that while he would be honored if he were to be inducted into the Hall of Fame, he would not be upset if he were not elected, feeling that the Steelers already in the Hall (in particular, "Mean Joe" Greene) represent the entire team's accomplishments. Greenwood died of kidney failure on September 29, 2013. He was 67 years old. ↑ "Hall of Famers: L.C. Greenwood". Akron, Ohio: Pro Football Hall of Fame. Retrieved 2009-08-03. ↑ "Steelers Records" (PDF). Retrieved 2009-08-03. ↑ "Super Bowl IX play-by-play". USA TODAY. January 11, 2002. Retrieved April 5, 2013. ↑ "Super Bowl X play-by-play". USA TODAY. January 11, 2002. Retrieved April 5, 2013. ↑ "Greene: L.C. Greenwood 'being cheated' out of Hall". Pittsburgh Tribune Review. Retrieved 2015-02-04. ↑ "L. C. Greenwood, Member of Steel Curtain, Dies at 67". New York Times. Retrieved 2015-02-04. ↑ Ray Fittipaldo (September 29, 2013). "Former Steeler L.C. Greenwood dies at 67". Pittsburgh Post-Gazette. Retrieved September 29, 2013.